BYFIELD -- It was a battle to the finish, between undefeated ISL powers Governor's and Lawrence Academy on Saturday. 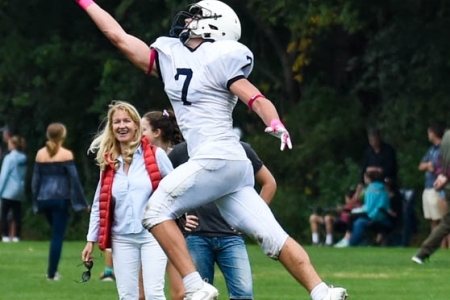 In a hotly-contested battle, it would be LA who would prevail, as RB Josh Arruda '19 would score from 3 yards out , on the ground, to give the Spartans a 27-20 victory. Lawrence Academy (3-0) was led offensively by QB Brady Martin '20 (2 TD passes) and Juan Muse '21 (2 TDs - 1 Rush, 1 Rec). Governor's (2-1)was led by QB Jared Dupere '18 and RB Quin Stott '19 as Dupere tossed 3 TDs and threw for nearly 300 yards and Stott totaled over 150 yards from scrimmage.